Yes. 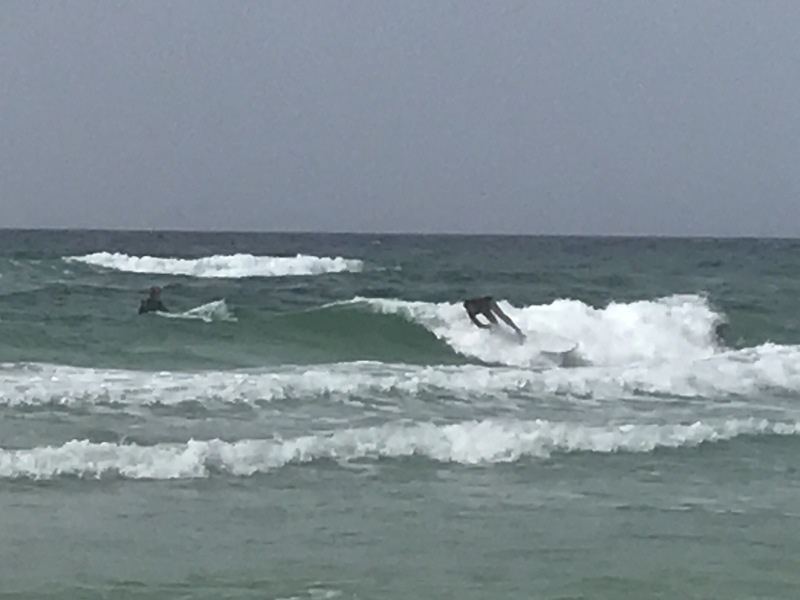 Yes, you can surf the gulf coast. I started surfing when I was 30 years old on the East Coast of Florida, Cocoa Beach. I was living in Orlando, 45 minutes from Cocoa Beach, single, and ready to take charge of my life in a brand new way after some personal discoveries. Surfing had been a lifelong dream and taking action was a result of inner change. For the first time in my life, I now live two minutes from the beach. Two minutes! I still can’t believe it. It’s the result of ten years of hard work and sacrifice by my husband. I am thrilled to live closer to the water, knowing I have more of an opportunity to play on the water. 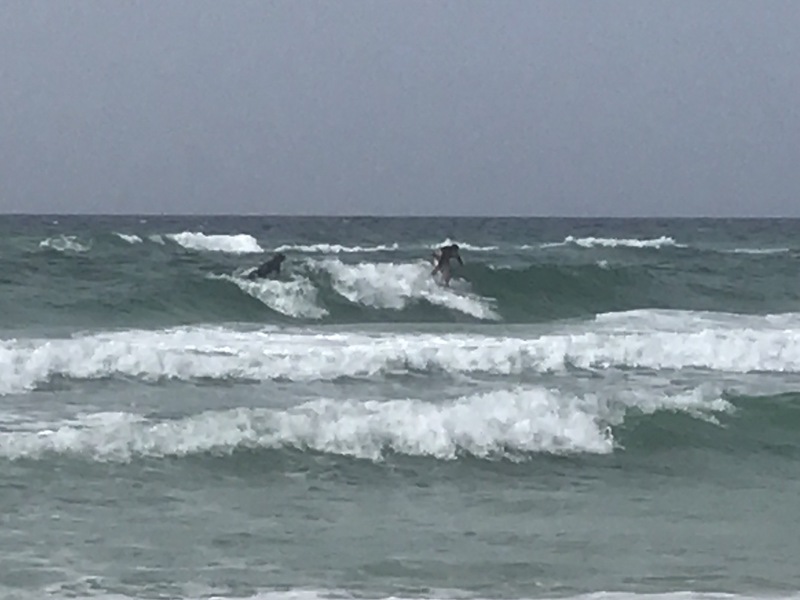 Before we moved over here, I figured I’d get to surf occasionally, when there was a storm in the gulf. In the meantime, I’d learn to paddle board, and I’d body board, play and swim. It’s the ocean – my place of peace on this earth. My dad grew up in Tallahassee, and I used to hear him tell stories of surfing in the ’60s on the gulf coast. It was always fascinating to me – a dream world of adventure and fun. There was the most exciting story about a shark. 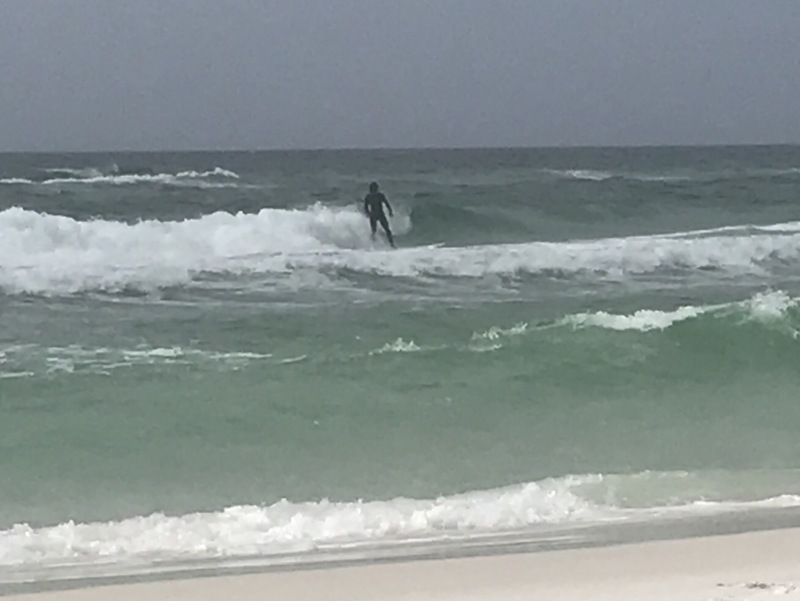 Dad was out surfing, and all of a sudden all of his buddies on shore were jumping around and waving at him to come in. He turned and saw the shark and never paddled so hard in his life to get into shore. We talked about surfing together, but being two hours away from the nearest surf spot before the internet existed made surfing more difficult. Dad taught me how to swim and how to body surf and ride waves; he gave me a strong foundation. He also was thrilled when I started surfing. Unfortunately, he only saw me surf on video since he was in the last years of fighting cancer and we lived 4 hours from each other. That video was of me surfing waves at Big Island, Hawaii. Pretty epic. 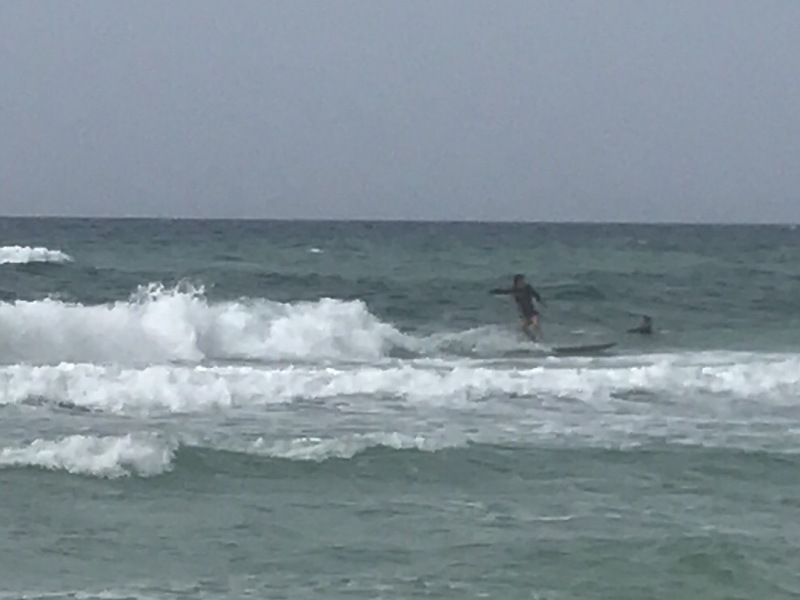 Thanks to my friend, Cliff Millender, I surfed the panhandle gulf years before I moved here, but it was when I came up from Orlando and a bunch of us piled in the car and drove together from Tallahassee. 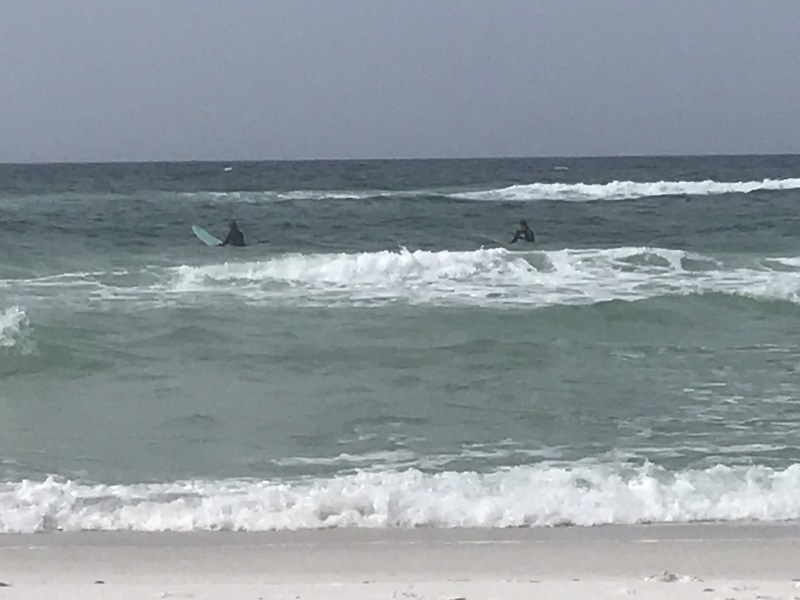 The first time I surfed the gulf, it was different surf than East Coast and what I was used to. The waves were more mush than even the east coast. Cliff’s so good, he got barreled several times because he’d been surfing for 12 years or more at the time and got outside to the cleaner waves. I’d been surfing less than a year, then, and I was happy to ride the wash.
A beautiful thing: living here, having the ability to view the beach daily, I know how wrong I was. Again. This place has frequent and decent surf, and I don’t have to wait for storms. With the jetties around, there is almost always a place to catch a wave. So, if you love to surf and you want to make your home in a beautiful area of the country, don’t forget about Florida’s gulf coast. Pristine, crystal water, friendly folks, and nice waves. A wave overcomes everything in its path. Musings of a female doc chasing the meaning of life.